On the list of Indians who represented India at some front and made Indians proud by their talent, activities, product or services, I will introduce you the Inventor of Femto-photography, Founder of EyeNetra, co-director of Center for future story telling and the inventor of transient imaging technique Ramesh Raskar. "It bounces ultra-short bursts of laser light off a rigid surface—the wall opposite an open door, for instance—at several different angles and measures the time it takes the light to return to the camera.". In order to capture these ultra short bursts of laser light bouncing back from the corner object and off the walls of the open door, the technique needs a camera which can take trillions of frames in a second and thus able to frame a picture out of those ultra short bursts. Raskar performed an experiment in which he fired a photon of light merely of size of a millimeter in length which traveled through a transparent bottle at the speed of light and he made a motion picture or a slow video of this whole phenomena, showing light in slow motion travelling through the bottle creating ripples in the liquid and scattering while facing any reflecting surface. This technique of Raskar can be used to see through a human body without an X-Ray or can be used to develop the next generation CAT scan machine. Raskar has more than 40 patents on his name and he has also won 4 of the Mitsubishi Electric invention award. 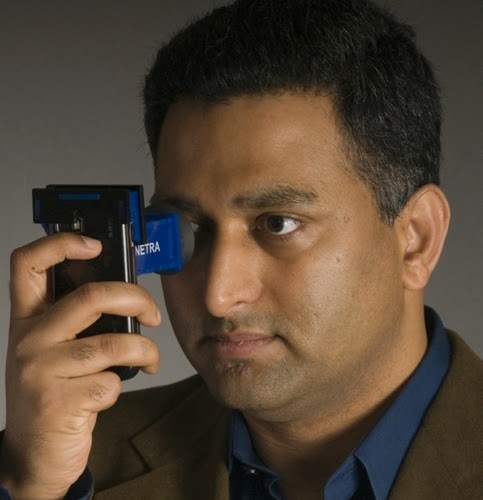 He is also the inventor of technologies like Touch & hover 3D Interaction display(BiDi Screen), low cost eye care device NETRA and new theoretical model to augment light fields (ALF) to represent wave phenomena of light.